CD1: The Lads ‘O The Fair (Brian McNeill) * The Kelpies Suite Including Myth, We Toss Our Mains and Wait, We See Them Run, Majesty, The Kelpies’ Promise and Mystery (Falkirk School Ensemble) * You Are The Pillar (Mercy Nyirongo & Pupils of Bandawa Girls Secondary School) * Stirling Brig (Bo’ness and Carriden Band) * A Mariner Who’s Never Been To Sea (Andy McKean, Marc Duff & Brian McNeill) * The Terror Time / The Pogoing Painter / Clueless (Pipes - Amy Low) * The Boys That Broke The Ground (Brian McNeill & Andy McKean) * I’m a Bright Light (Louisa Foley, Robyn Gibb, James Greenaway, Mark Adams & Rachel Paterson) * Tam Bain’s Lum / Angus MacKinnon (Fiddles - Sheila Airth, Sandy Harvey, John Johnstone, Mary McElroy, Jennifer Simpson & Lorna Swan) * Tae Feed a Hungry Child (Brian McNeill and Sylvia Barnes). CD2: Ndibwerera - Am Coming Home (Mercy Nyirongo, Faith Banda, Dyna Mphepo & Memory Msowoya, plus the pupils of Bandawa Girls Secondary School) * The Great Wheel / Schiehallion (John Somerville, Marc Duff & Steven Holland) * The Men of Twenty Three (Willy Thomson) * Mr Graham Stirling of Airth’s Strathspey / Airth Castle (Rita McAllister) * The Travelling Nation’s Pride (Sylvia Barnes) * Sergeant Stuart ‘Gus’ Millar / Blackness Castle / William Marshall / Ochil View (Pipes - Emma Buchan) * The Carron River (Andrew Howie) * Bothkenner / The Beauty O’ The Bing (Brian McNeill & John Somerville) * Train Tracks (Liam McIntosh & Ellie Williams - Bo’ness Academy) * My Love is Like a Red, Red Rose (Bo’ness and Carriden Band) * The Best O’ The Barley (Brian McNeill) * Phala Phala Phala (Prisca Chirwa and Pupils of Bandawa Girls Secondary School). The Falkirk Music Pot is one of three projects forming part of the Falkirk Creative Place 2014 Award programme. 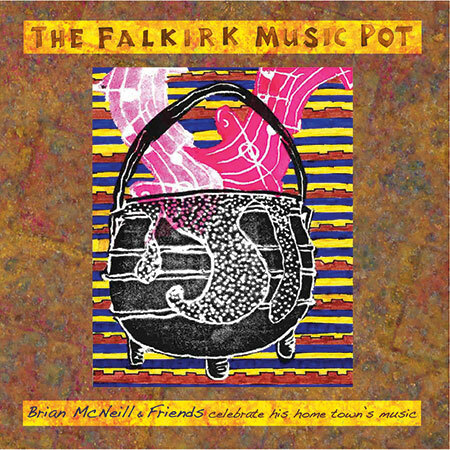 This recording project has been produced on behalf of Falkirk Community Trust and Falkirk Council by multi-instrumentalist, singer, songwriter and author Brian McNeill. The project has involved Brian of course and other professional musicians and singers, but also includes items by local residents, schools and bands plus recordings from Bandawa Girls Secondary School, Malawi. In January 2014, Falkirk was officially designated a Creative Place. The successful bid to Creative Scotland’s 2014 Creative Place Awards was co-ordinated by Falkirk Community Trust on behalf of a number of partner agencies (see sleeve notes). The Falkirk Music Pot is one of three projects forming part of the Creative Place programme entitled Acts Of Discovery which complement and build on the distinctive features of cultural activity in the area. Falkirk-born musician Brian McNeill was invited to become involved and brought expertise, passion, energy and a wealth of experience to the project. A career spanning 45 years has established Brian as one of the most acclaimed forces in Scotland’s music. He’s been described as “Scotland’s most meaningful contemporary songwriter” by The Scotsman. Add to that his work and influence as performer, composer, producer, teacher, musical director, band leader, novelist and interpreter of Scotland’s past, present and future and you have a man who has never stood still. He has performed around the globe, both as a soloist and with some of the most influential Scottish bands including The Battlefield Band. Brian brings many of his own songs to the project, including such classics as The Lads O’ The Fair, The Boys That Broke The Ground and The Best O’ The Barley, and also plays some of his own compositions. Special mention must be given to Sylvia Barnes’ interpretation of Brian’s song The Travelling Nation’s Pride but this album is full of gems, including a wide variety of sounds from local singers and musicians plus pupils of Falkirk schools, The Bo’ness & Carriden Band and solo pipers Amy Low and Emma Buchan. The wonderful Kelpies Suite consists of seven pieces of song and music. Scotland’s links with Malawi in southern Africa are numerous and Falkirk High School has an ongoing partnership with Bandawe Girls Secondary School, resulting in three tracks from singers and pupils of this school, giving the album an international dimension. Brian McNeill and Jacqueline France spent a week at Bandawe School in September 2014, working with the girls and recording them. The eye-catching cover was designed by Brian McNeill, with additional artwork by Jacqueline France. Booklet designed by Iain Stretford. Mastered by Peter Haigh, Pier House Studios. This is an amazing mix of songs and music bound to please all music lovers, which has been a labour of love by Falkirk-born Brian McNeill.